What You Need to Know About Getting Your Car Repaired After a Collision - Muscle Cars Zone! No one plans for or wants to be involved in a car accident. It usually happens quickly. Most people’s first reaction is shock, then anxiety, often followed by the inability to think clearly. To make matters worse, when insurance companies are involved, you want to make sure you don’t say anything that can hurt you should you be entitled to damages. Being involved in an accident is very stressful. However, what you do immediately afterwards can lessen the impact of injuries, reduce the amount of time and money needed for repairs, and even save lives after the collision. The first thing to try to do is remain calm. That is easier said than done but vital so you can make informed decisions. In addition, realize that you can`t control everything in life, but you can control how you react. Rather than getting stressed out over expensive car repairs, try to be as productive as possible in the decisions you make following an accident. You have certain rights when it comes to getting your vehicle repaired, no matter what brand you own. Statistics show that drivers will be involved in an auto accident approximately once every seven to ten years. 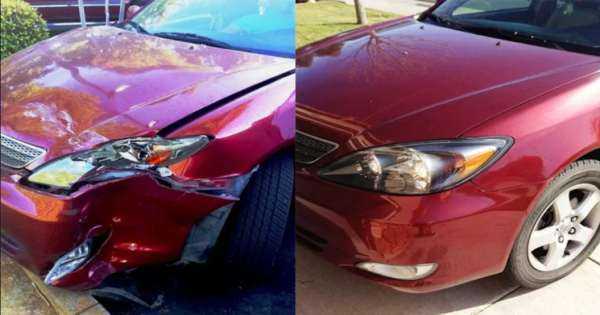 How Much Damage Has Been Done to Your Car? Accidents vary from fender benders to those that do significant damage to your car. Major accidents often leave you with no choice but to repair your vehicle if you want to continue driving it. You can choose to fix your car or not. You might decide to fix a minor repair such as a small dent yourself and not report it to the insurance company. Most insurance companies have a deductible and most also raise your premiums after an accident. A study done by Quadrant Information Services and insuranceQuotes found that drivers who make one claim of $2000 or more, on average, will see a 44.1 % increase in their premium. You need to decide whether to report the accident to your insurance company. Even if your insurance company will cover a repair, such as replacing a car door, the rise in your premium might cost you more than if you pay for the repair out of your own pocket. If you own your car, you do not have to get it repaired if it is safe and can pass inspection. For older cars, it might make better sense to not turn in a claim, especially if the amount of the repair is below your deductible. If the accident causes damage to someone else`s car, you should report it to your insurance company. You have the choice in most cases, to select the collision center to do the repairs on your vehicle. Not all shops are the same. Choose one that has properly-trained mechanics with the experience required to fix your car correctly. Sometimes insurance companies will recommend that you use a shop they have a contractual agreement with, but you are required to do so. It is also a good idea to ask friends and family to recommend repair facilities they have used and trust. Don’t forget to check with the service department at the dealership where you purchased your vehicle. Many have their own body shop repair departments. If you had enough trust in their integrity and professionalism to buy from them, you are more likely to be comfortable using the other services they provide. Will you be provided with a rental car to use while your vehicle is being repaired? If yes, does your insurance company pay for the rental? Do you have to deal with your insurance company, or will the shop handle it for you? How long will the repair take, and will you be given periodic updates on the progress? It`s not worth it to waste your time getting an estimate from a shop you have no intention of taking your vehicle to for repair. Choose businesses you would actually consider using. Make sure the estimate is thorough and covers all the damage and necessary repairs. You don’t want any surprises when it comes time to pay your bill. The initial inspection will include photos, and the estimate will be shared with your insurance company. One thing to keep in mind is that it is not uncommon for additional damage to be uncovered once the repair process begins and the car is disassembled. It`s better to have the knowledge you need and know what questions to ask before you have an accident. This way you can be prepared if you are involved in a collision and need to have your vehicle repaired.